Insert the Seventh.jar file to Your project. Create a new directory named lib (if it does't already exists) in Your projects directory. It should be in the same directory with src an bin now. To make the Seventh.jar file known to Your project select in the menu Project – Properties – Java Build Path. On the Tab Libraries use Add External JARs and add the Seventh.jar file. Then go in the menu to File – Export – Runnable Jar File. Eclipse's Runnable Jar Export Wizard inserts the Seventh.jar and some more class files beginning with something like org/eclipse/jdt/internal/jarinjarloader/Rsrc… automaticly to Your projects jar file. That makes the 7th stuff accessible from within Your program. Now it's possible to communicate in both ways – with javax. You can execute public methods in the calling Java class within 7th. With the following program You can encrypt an entered text. 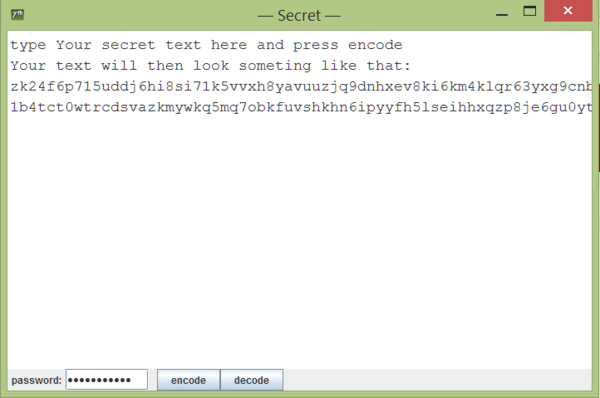 The encrypted text is stored to the clipboard, so You can paste it with ^V (CTRL-V) to a file. * Copyright (c) 2018, 7th Stone Software GmbH. All rights reserved. * 7th Stone Software GmbH PROPRIETARY/CONFIDENTIAL.